And I decided to give my prof a surprise by sitting in his lecture. The last time I went to consult him on some LaTex issues, he showed me the website for his lecture this semester. I managed to notice that his lecture days are Tuesdays and Fridays. But I missed the timing and venue. So I got one of my friends to help me check. I sneaked in from the back door of LT26 to his lecture. 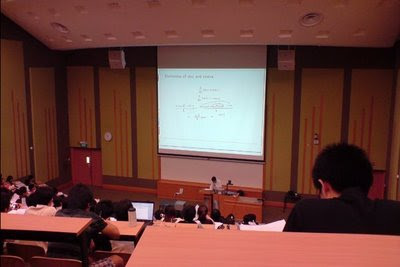 The lecture had already begun went I went in and there are a lot of freshies inside the hall. The greatest thing of all was that he didn't realise that I was listening to his lecture from the beginning right till the end. Lol. I managed to talk a shoot of the scene during his lecture. Seriously, I miss going for lectures and listening to him talk about the interesting mathematicians he met and the stories of mathematicians he knew. But my objective of this lecture crash was to note how he teaches using tablet and the pdf annotator software. It wasn't really that useful as I am not doing a lecture but a classroom teaching. And... I don't have a high table to place my tablet on it so that I can write with more comfort. After the lecture, like all other students making their way out through the front door, I walk down to the front from where I was sitting and waiting at the first row of seats. Students were crowding in front of my prof as he tries to answer their questions and pack up. It was a nice surprise for him to see me in the lecture theatre while he was keepin his things in his bag. Hahaha... one happy face from him. I waited for his students to finish their questions and after that I went up to his office and had some interesting chat with him. Yeah... I wish I could study Number Theory but like he said, it is a rather difficult and challenging course. I got a B grade for his Intro to Number Theory course because I was hardworking and I ask questoins when I a not sure. Prof Chan shared with me some of his plans. He was disappointed that his application to NTU has been rejected. He is travelling to Japan this december and in September next year he is going to Collage de France as a visiting fellow. I like to sit in his office and look at his book shelf filled with 2 layers of books on each shelf. He told me that the estimated amount of all the books on the shelf is about $10k. Maybe I'll pop him a visit again with my jiemei when we come back to return the graduation gown.